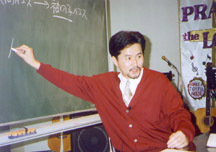 Christ for the Nations Japan Bible School, located in Ishikari, a suburb of Sapporo (capital city of Japan's northern island of Hokkaido) was founded in 1985 to meet the needs of a growing church in Japan and to prepare workers to participate in world-wide missions. Biblically-based and Spirit-led, with clear aims and attainable goals. CFN-J's curriculum is designed to nurture the God implanted seed of faith and the unique calling of each student, and to encourage them to follow the guidance of the Holy Spirit in their personal lives and ministry. During the first two years of Bible School CFN-J Students attend basic "core" classes that include: Old and New Testament Survey, The Gospel of John, "The Life and Teachings of Christ", Romans, The Epistles and Acts as well as additional classes in Praise and Worship, The Holy Spirit Today, Creation Science, World Missions, The Marriage Covenant, Prayer and Fasting, Church History, Personal Evangelism, and Practical Counseling. Graduates of the initial two-year program earn a Diploma in Practical Theology. Graduates with a two year diploma in Practical Theology, and other approved applicants, may apply for an additional year of study in CFN-J's Advanced School of Leadership Training and Pastoral Ministry. CFN-J will issue a three year Diploma in Practical Ministry to qualified graduates and accept applications for Ordination. In April 2007, CFN-J began an additional third year advanced course in Children's Ministry and Parenting. CFN-J has a vision to offer other advanced courses. Christ for the Nations Japan graduates are already ministering as Evangelists, Pastors, Teachers, Missionaries, Church workers, Child Evangelists and Praise and Worship leaders. Others are making an impact in Business, Education, the Arts and Communications. Also, as parents, graduates are better enabled to rely on the guidance of the Holy Spirit to raise godly children.